As the title of this post may suggest, I have been on holiday in Cumbria, where we welcomed in the New Year by doing a lot of walking in wild spaces. 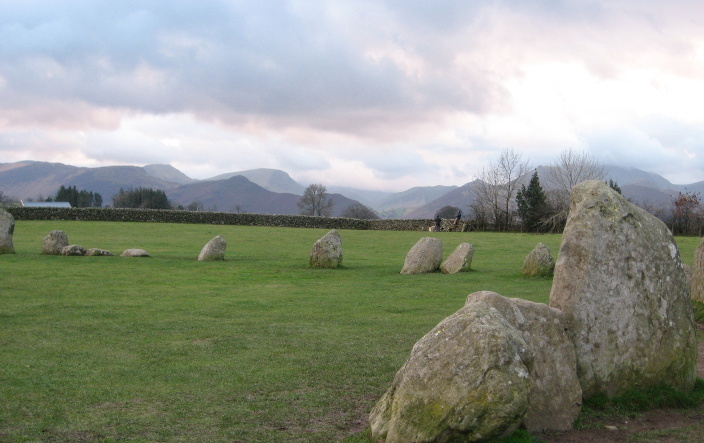 Oddly this particular stone circle is not wild at all, being in a well maintained field, a few yards from a road with parking spaces just outside Keswick. However it is surrounded by mountains so must have the best views of any circle I know. A circle represents completeness as well as the cyclical nature of life and each year within it. All people and all compass directions are represented equally, just as on this day there were many visitors speaking three or four different languages (that I heard), a great sharing global community. Many circles were built in alignment with sunrises and sunsets; this one is no exception, with several possible sight lines for sunrises at different times of the year, especially the solstices. While not there at sunset, I was able to see that all directions are visible, and that several rocks to appear to line up with specific fells and with compass directions. Castlerigg showing part of the inner enclosure. 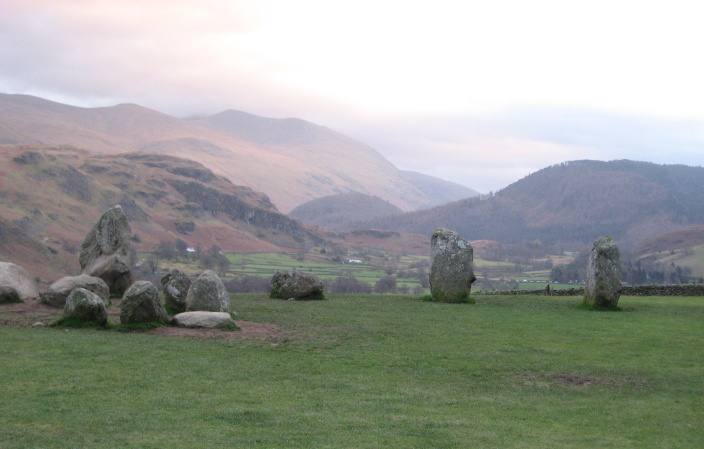 The circle is on an ancient trade route from Langdale, a centre for stone axes, three of which have been found on the site. 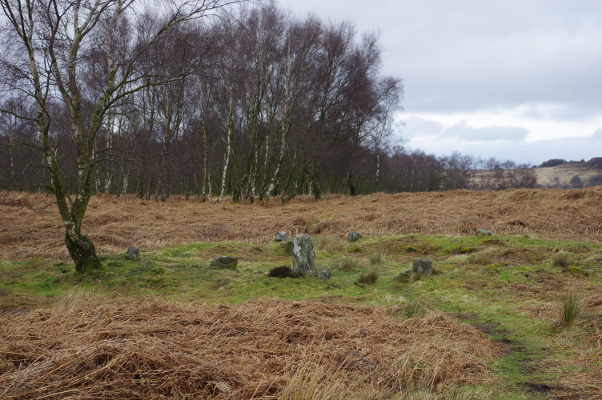 It is probably no coincidence that it is also one of the oldest stone circles in the country dating from the late Neolithic period rather than Bronze Age, just after the transition from henges. I had a sense of a demarcated space – the inner, square enclosure felt different to the circle as a whole and seemed reserved for particular people or ceremonies. I also had a sense that it may have had different purposes over a long period of usage, but overall it had a spiritual rather than a trading feel; any trade that happened here was probably on the periphery by virtue of people being brought together, rather than the intention of the site. I was there on the last day of the old calendar year, and took the opportunity to say thank you for the year I have had, as I continue growing in inner peace and harmony with the world around me, doing lots of what I love. I can now walk 6 miles on a good day provided I sit down when I stop, and have managed 4 new ‘Wainwright’ fells over the year bringing my total to 54, a quarter of the 214 he wrote about. I may not do them all, I may not even want to, but each one is a walk in a new place I haven’t been before. Best of all, they have been done with my family, my daughter now walking as far as I can. I also realised that it isn’t just relationships with humans I should ensure are positive, but with everything in my life. Trees and most plants already are, but money, transport – I have long talked to my bicycle but am not so keen on the car, sewing machines, pens and pencils, books, musical instruments … anything I bring into my life and use, I develop a relationship with. A positive partnership is more pleasurable and life-affirming than regarding everything as tools to serve me, or even worse, getting frustrated with it. 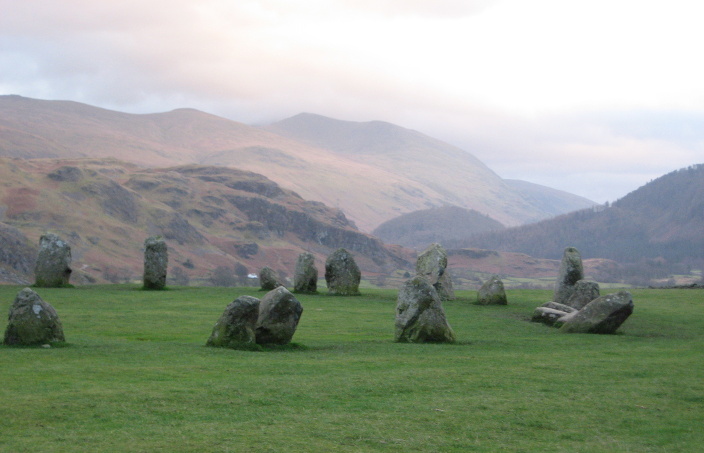 This is certainly what I saw at Castlerigg circle; people being happy together and in the wonderful mountain space that surrounded us, Earth and Air in perfect balance and harmony. Last week I was in the Land of Dragons, otherwise known as Wales, for a family holiday. I hadn’t made the connection before going, despite having briefly visited Wales in early June, but then it has been a few years since my last proper visit and nationalism seems to have grown in recent years with Welsh flags on display most places we went. So to see a lot of dragons in a country for which they are a national symbol of pride shouldn’t come as a surprise. However, this went a step further, starting before I even left home. The day before going, I was having trouble in my meditation with a lack of concentration for various reasons. I persevered, and then suddenly a small fire dragon bounded in. I haven’t met any dragon like this one before, dark orange, flames everywhere, very small (only waist high and four foot wingspan) and behaving like a small puppy bouncing about, chasing its tail, and utterly full of life. We agreed I could call him Fireball. Exactly what I needed personally at that moment. He then said it was good to see me again!!! Apparently I have known fire dragons before, although this is definitely the first time I have seen one in this lifetime. Meanwhile, I was told he would be coming on holiday with us, and was really looking forwards to it. Fireball looks a little like a Welsh dragon, but there are some differences; he is more like the colour of ripe Rowan berries and his wings are smaller in proportion. Day two, Dinas Emrys seemed to be the place we had to go to. Despite visiting Beddgelert many times in the past, I hadn’t been there – and it seemed a good size for M’s first Welsh hill. And of course it is entirely bound up with the legends of dragons. Dinas Emrys as seen from above Sygyn Copper Mine. 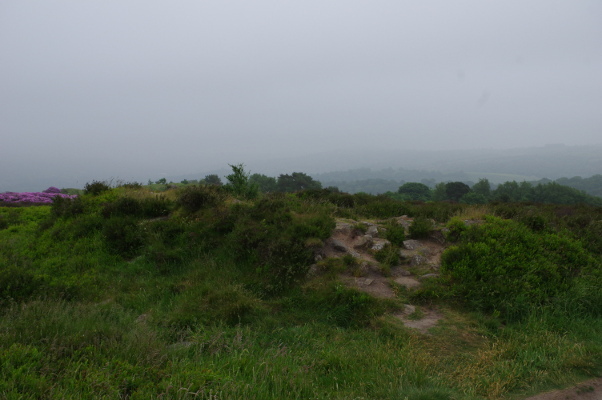 It is the small hill on bottom right. 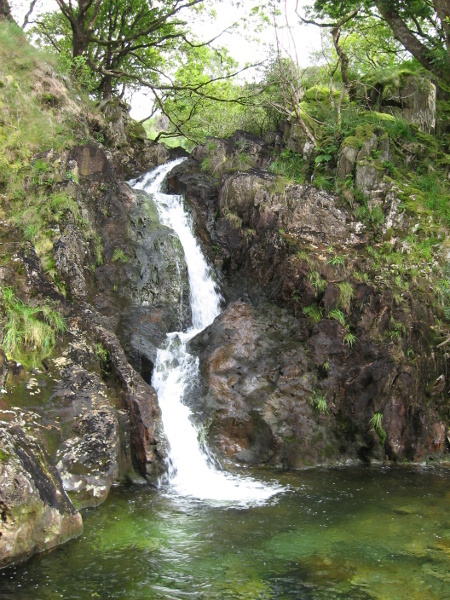 Dinas Emrys – waterfall that is passed on the way. The first part of the legend comes from The Mabinogi(on), a collection of ancient Welsh tales written down in the twelfth and thirteenth centuries. After Beli Mawr died, his eldest son Lludd became king. He was wise and generous, but after many years of peace he was hit by three curses – gossip, shrieks on Beltane that terrified the people and withered everything, and vanishing of food that was stored, turning the country into a wasteland. Luckily his younger brother Llyfelys, now king of France thanks to marriage, knew the remedies to the curses. While the first was caused by the race of Coranians, who Llyfelys had the way of removing from the land, and the third was caused by a giant who became loyal to Lludd after being beaten by him in a fight, the second was caused by two dragons residing in the centre of his land who each year fought for supremacy. 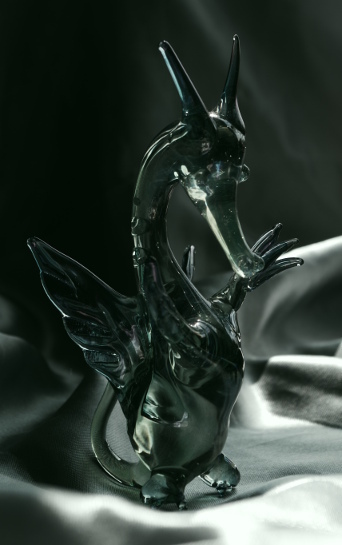 One was their own dragon, the other that of a foreign race, trying to overcome it, causing the native dragon to cry out. 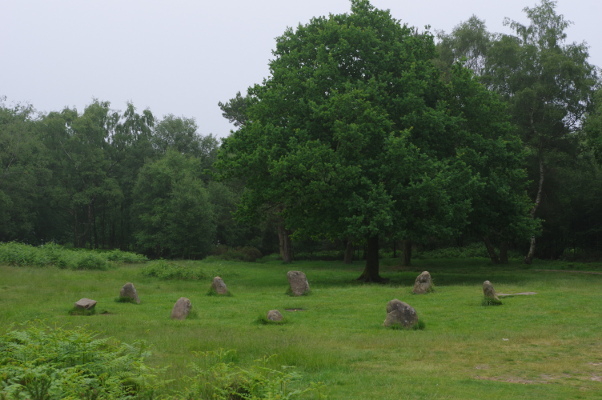 The centre was traced to Oxford, where they found a stone circle and a murky lake. Placing a cauldron filled with mead next to the lake, covering it with a cloth and disguising it with the mud, Lludd then placed wax in his ears and retreated to the stone circle for safety. As it grew dark, he felt an awesome shudder from the earth and knew the screams had begun. From the lake, two serpents, one red, one white, rose up from the deep, water dripping off their scales. The battle continued as they shape shifted many times until they resumed their true forms, fire and ice breathing dragons. Up in the air they fought, snapping and snarling, until finally exhausted they transformed into two piglets and fell back to earth, through the cloth and into the cauldron. There they drank the mead and fell into a deep sleep. Lludd quickly put each piglet into a stone jar, placed them on his cart and drove non-stop to the most secure part of his kingdom, Eryri (the mountains of Snowdonia). Finally he came to a hill called Dinas Ffaron Dandde (Hill of the Fiery Pharoah), just below the highest mountain of all, Yr Wyddfa. There in the hollow summit he found a pool, into which he hurled the two stone jars with all his strength. As they splashed into the water, the lake was swallowed by the hill, now renamed Dinas Emrys, leaving nothing but grass and stones. 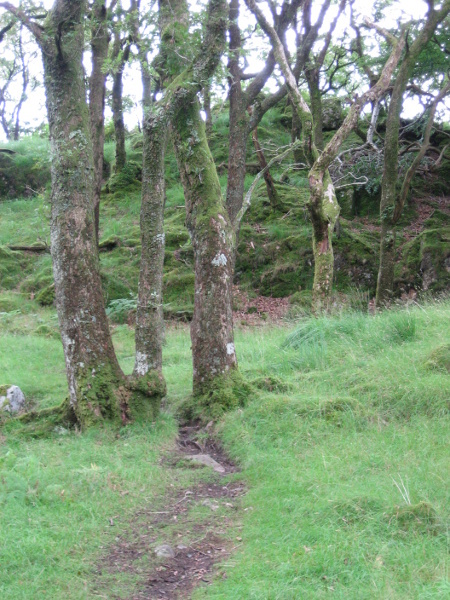 Dinas Emrys, slow growing woodland and optical illusion of a tree ‘gateway’. A little later in history, after the Romans left, King Constantine had two sons, Ambrosius and Uther. Unfortunately he also had a ‘Prime Minister’ Vortigern who coveted the crown, and who arranged Constantine’s death by a band of Picts. 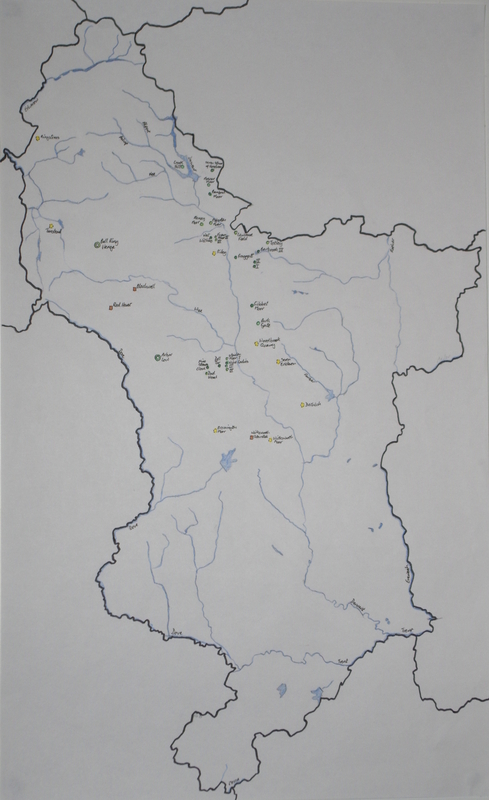 (Constantine’s young sons where whisked off to Brittany for safety.) Vortigern then invited the Saxons to get rid of the Picts – and gave them Kent in return, which worked fine until the Saxons wanted to take over Vortigern’s land as well. Barely escaping from a ‘parley’ with his life when the Saxons drew knives, Vortigern fled to Dinas Emrys and attempted to build a fortress there. However, while his men worked hard at the building work each day, every night their efforts were undone and they had to start all over again. In frustration, Vortigern consulted his wise men, who said he must find a ‘fatherless boy’ and sacrifice him over the hill to appease the spirits. The child found was Myrddin Emrys, whose mother had apparently become pregnant by an incubus spirit, so was still a virgin and the boy was baptised to remove the spirit from influencing him. However it seems most likely his mother was a priestess of the ‘old faith’ and took part in a pagan Great Rite with a masked stranger intended to create a child of destiny who would become a teacher and saviour of his age – and then adopted the Christian story as times changed. The child, later known as Merlin, escaped from his captors and persuaded the men to dig into the hill – where they found a lake as he predicted. Then he said in the pool there were two stone jars, each of which contained a sleeping dragon. These were found, the dragons were released and fought, the red dragon killing the white dragon, and peace was allowed to return. Vortigern’s castle was then completed and named Dinas Emrys in honour of Myrddin Emrys, (yes the second time it was apparently renamed Emrys; there is a suggestion it was actually Emyr meaning Emperor, Lord or King, possibly relating to the Emyr Llydaw, which was the Welsh name for Brittany but I digress) and the red dragon has been celebrated in Wales ever since. Meanwhile the young Merlin gave a prophecy and a warning about the Saxons, and Vortigern took his advice to flee for his life. Ambrosius and Uther had now come of age, returned from Brittany, and hunted Vortigern until he jumped off a cliff to his death. Dinas Emrys and the rock remains. There is also some natural rock to walk up just above this. 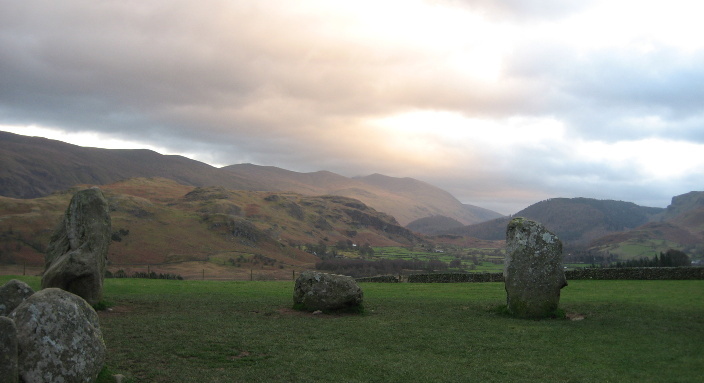 Dinas Emrys was a gathering place for tribes in North Wales for at least 1500 years. Whenever danger threatened, they retreated to this heartland to take council with each other; I have seen it suggested it was an Omphalos, or Sacred Centre. The Slovenian artist and Earth healer Marko Pogacnik would probably call it part of a ‘nature temple’, somewhere that acts as a focal point for all the elemental kingdoms and has a far reaching energetic influence on the surrounding lands. 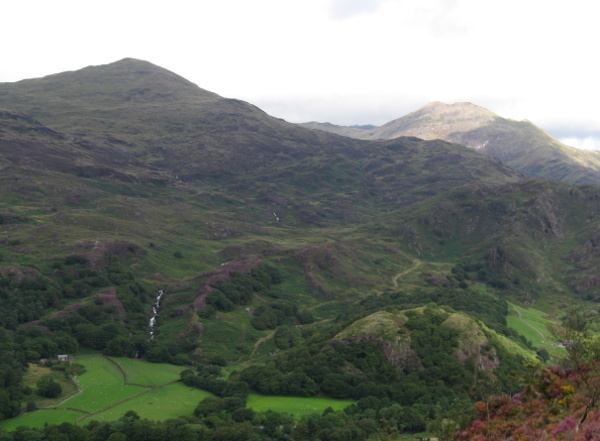 Part, because it is also feels connected to Llyn Dinas in one direction, and the confluence of the Glaslyn and Colwyn rivers at Beddgelert in the other. 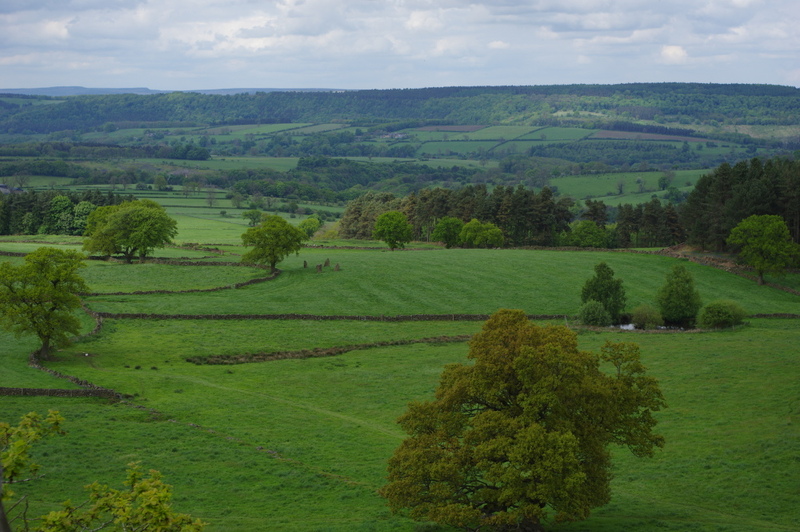 It is quite a special hill to walk up, with three ‘gateways’: first a water crossing (stepping stones optional, there is a stone bridge), then a tree gap and then a narrow rock gap that was once part of a Norman fort to the hill above. There is also a rather fine, carved, wooden dragon bench we found on the return route. Day three: after the first two days, I was excited to find out what the dragon connection would be next. 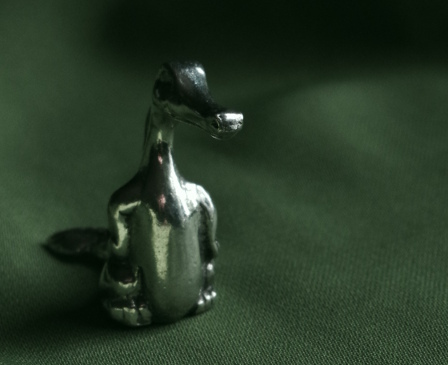 It was wet, so we headed to Llanberis – where I found this tiny fella made of pewter. Day five saw red dragons following us along the Welsh Highland Railway, where they have a really beautiful symbol on the end of their station benches – everywhere except at Porthmadog that is, so I wasn’t expecting to see it (and didn’t get a photograph – it was raining at some of the other stations.) 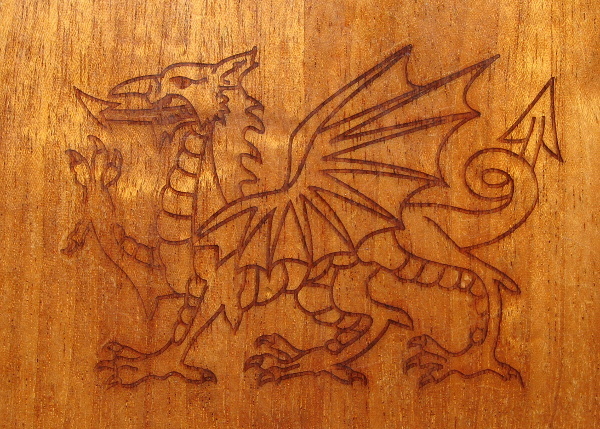 Some of the carriage tables also have a nicely drawn dragon next to a map of the line. Finally day seven and eight both saw rather fine metal dragon sculptures, both painted red and both totally unique. On my return I asked Fireball for some more details about some of these, included here, and then was told he would meet me on Dragon Hill in a week or so’s time. I can’t think where Dragon Hill is at the moment, but I’m looking forward to it already. 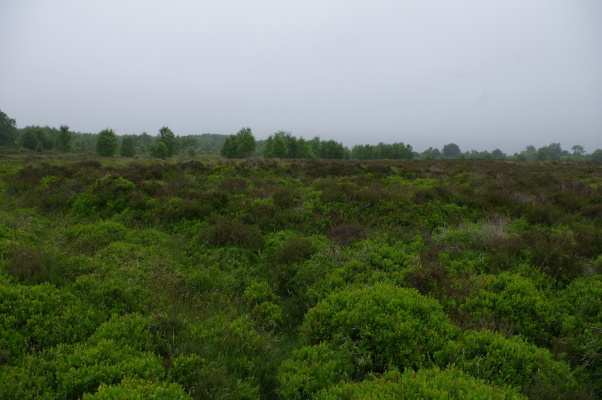 This is a circle I have visited previously, as it is almost impossible to miss if you are in the area. 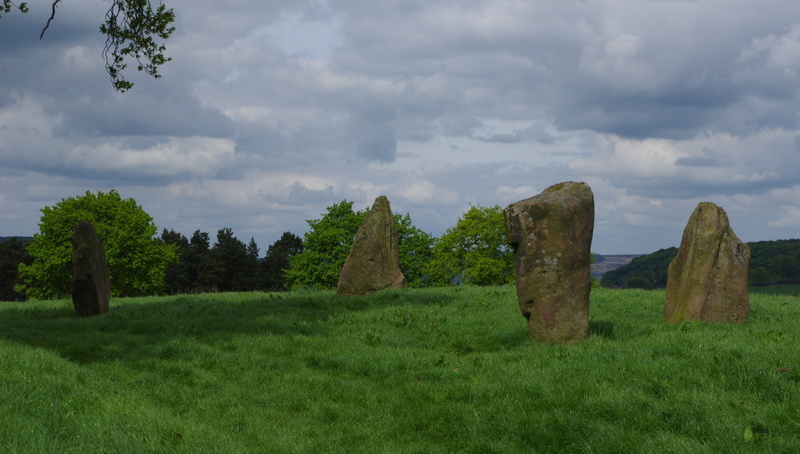 The four remaining stones are apparently the tallest in Derbyshire, all well over six foot. I do not know why it is called Nine Stones Close, as there are not and probably never have been exactly nine stones. Drawings exist from the mid and late nineteenth century showing 7 and 6 stones respectively, and estimates of the original number seem to be 11 or even 13, which makes sense on the ground; I felt it larger than 9. There are suggestions it may have actually been called Noon or Moon Stones Close, since the moon sets over Robin Hood’s Stride, a major rock feature in the area. (Robin Hood in this instance is another name for the Green man, the old God of fertility.) 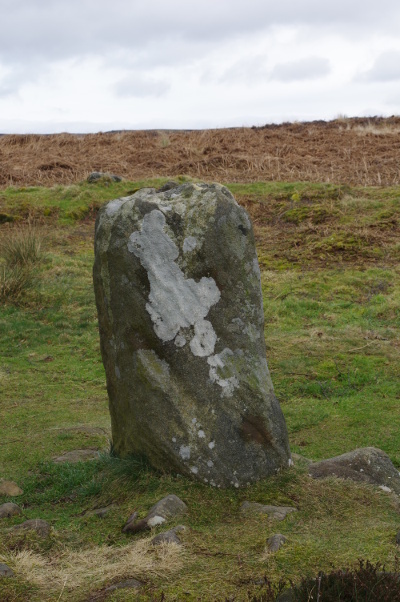 The circle is also known as the Grey Ladies, who were dancing until turned to stone when Robin Hood p****d on them from the stride… a very familiar story of dancers being turned to stone although the addition of a giant standing on the rock outcrop makes it slightly more local. 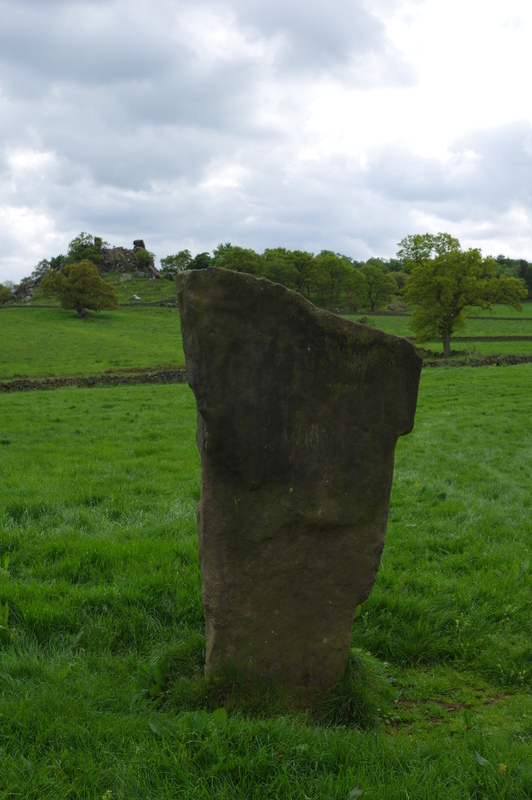 Two northern stones of Nine Stones Close circle, the further one showing the remains of a cup on top. Each stone has its own character, all quite different in looks if not in size. 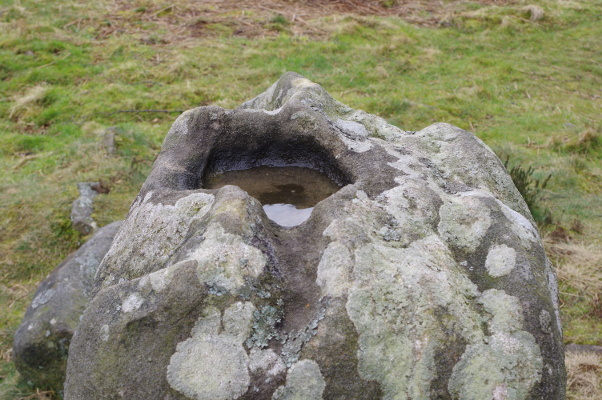 Two originally had a cup in the top to catch rainwater, although these have both weathered a channel so that they now leak. There is one with a ‘smile’ again, although my imagination may be working overtime here. 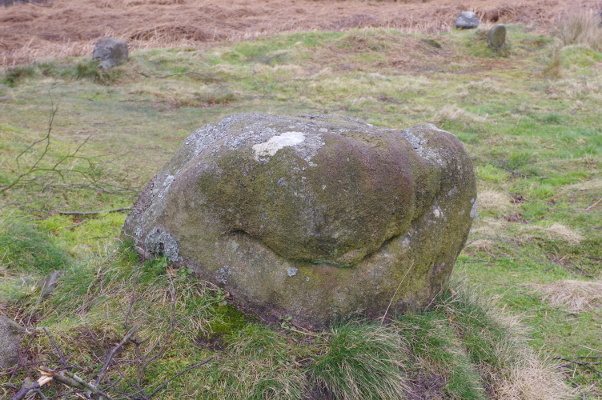 They are all of local gritstone and probably did not travel very far – there are some pretty large boulders scattered about the area only a couple of fields away, in addition to the taller outcrop of the Stride. As a circle however, it is broken. The position where a stone once stood between the two pairs can be felt, as can the next stone around the circle in each direction, but then it fades out for me. So sitting there, I did not get strong positive feelings and circling energies that I get from sitting in a completed circle. 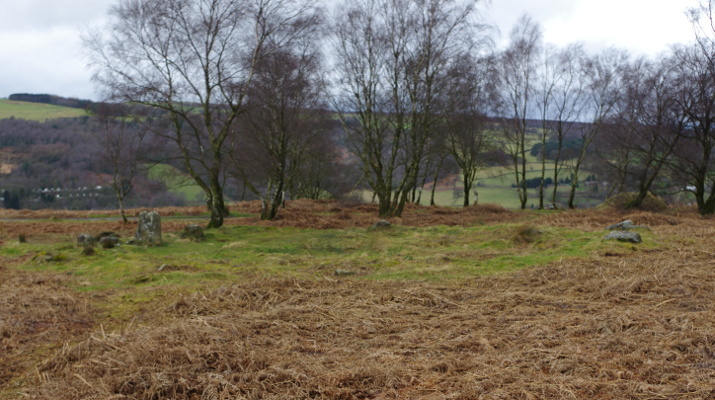 It is also a fairly windswept site, with little intimacy, and the surrounding countryside kept drawing me out of the circle, rather than focusing my energies within. After a few minutes of getting nowhere, I decided to continue on my walk. 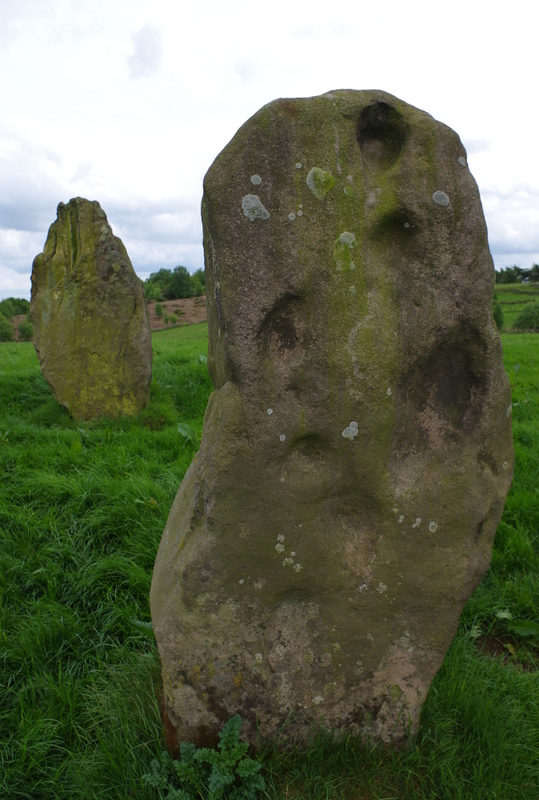 The four remaining stones of Nine Stones Close circle in Derbyshire. A few days later I returned to the circle in a journey. Again, the circle felt broken and my first feelings were of frustration and disappointment that I didn’t seem to be able to connect with it or learn anything more. However I was then shown a way of ‘mending’ the circle by placing quartz points where stones should be, pointing along the energy lines I could feel, and amplifying what was there. I did this and continued placing quartz points until the circle was complete. Suddenly it felt far more worthwhile, although the energy was still very low. Then I remembered how the name might have been Moon Stones, and ‘fast forwarded’ to night time and a full moon. 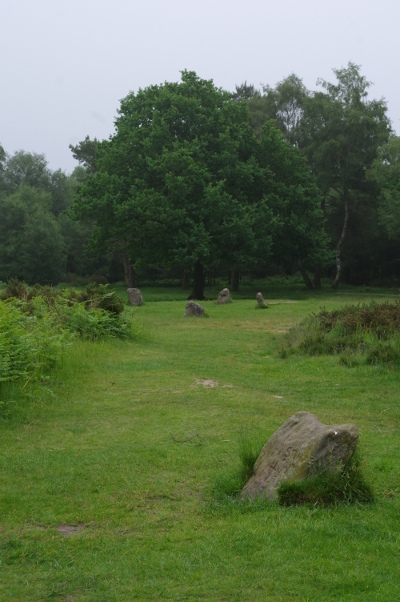 Nine Stones Close stone pointing towards Robin Hood’s Stride to the South. At this point the circle and surrounding area came alive. I became aware of literally hundreds of people there, mostly wearing dark clothing, standing outside and behind the circle to watch the rising of the full moon in silence. Out of respect most did not enter the circle, although there was one man, possibly a priest officiating in a lighter coloured cloak, who remained within it and at times others entered for healing while the moon shone on the circle. My focus was poor and I did not stay long, but I had other impressions of other times of year when the moon was not in quite the right place or quite full when smaller groups of people or individuals would come and benefit from ‘moon power’. I interpreted this as healing, divination or intuition. This may all be my imagination working overtime, or there may be something in this, I have no way of telling. I did however feel this circle, once mended, as very different from those I have previously written about and far more ceremonial than small ‘family’ circles as I now think of the last one I visited. 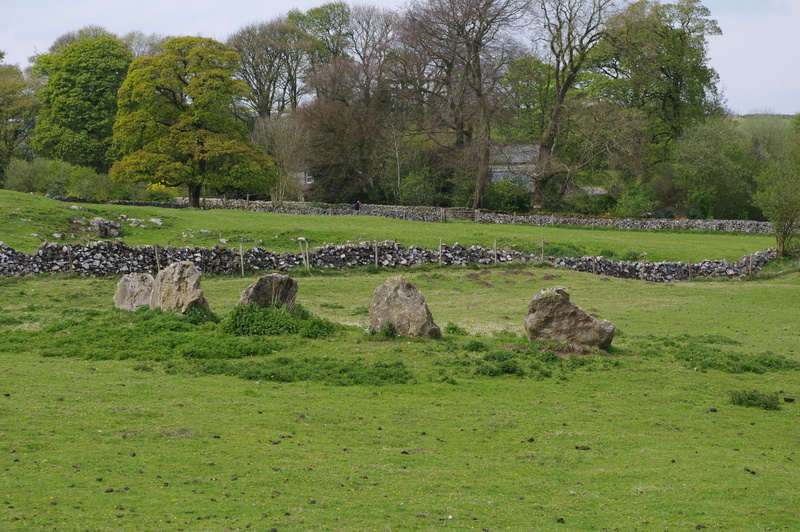 John Barnatt in his book ‘Stone Circles of the Peak’ suggests that tall stones were used for this circle so that they could be seen over the trees in what was a relatively lowland, wooded area – in fact the lowest of all Peak District stone circles. There may be something in this as nearby I had read of and seen a few pictures of a circle known as ‘Dudwood’, so after visiting Nine Stones Close circle I made an attempt to find it. Looking for stones through trees is surprisingly challenging! Shadows and stumps catch your attention, but stones do a good job of hiding. I found various stones, but failed to find any arranged in a circle. The three references I rechecked afterwards (a 6-figure grid reference, and two Lat/Long positions) were to three different spots, none of which are exactly correct. 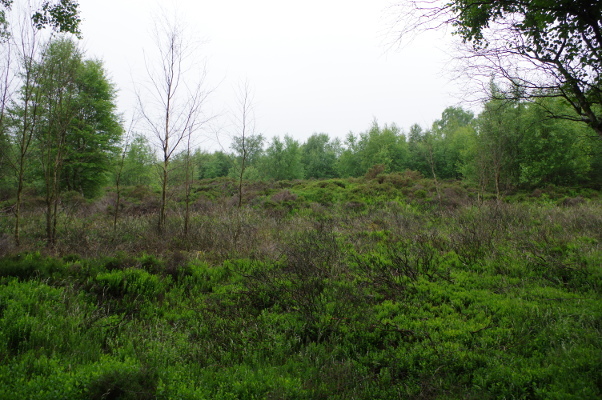 (I know that because I had looked in two of the three places, and the third was too steep and wooded.) From the photos I think I now know where to look (not in the woods!) so may try again one day, but as it is most likely a ‘hut circle’ remains and not built for the stones themselves, it is a little low on my priority list. However I had a really special experience in the woodland by my looking. (A path runs along the outside of the wood, on the edge of Access Land.) 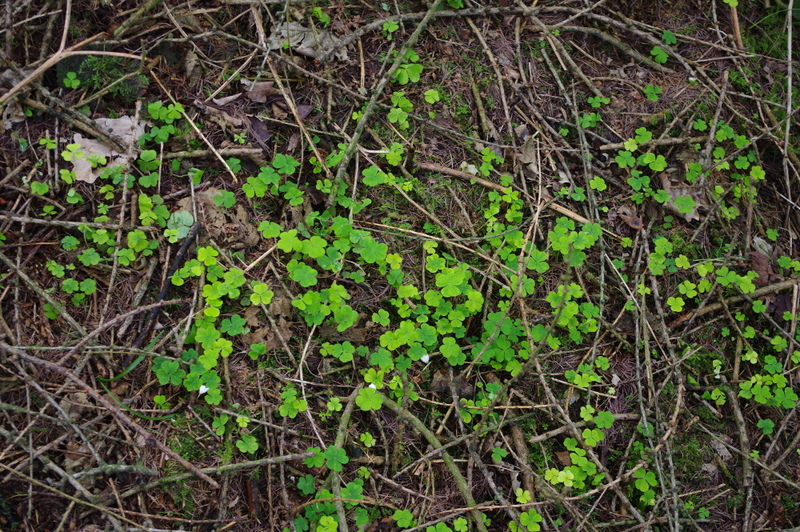 My namesake Wood-sorrel carpeted the floor, the last of the bluebells were now faded but still good, and I found some very beautiful mossy rocks. So the search was worthwhile even if unsuccessful. 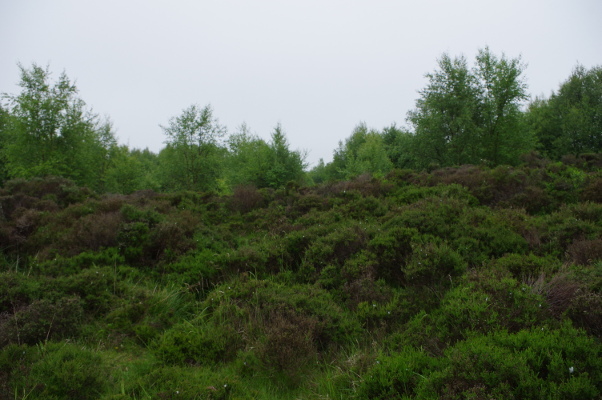 Also it will remind me that sometimes it is worth following other people’s descriptions of how to find a circle, especially when it is not marked on a map in any way – although in this case it was a completely unplanned walk that was decided in the car! 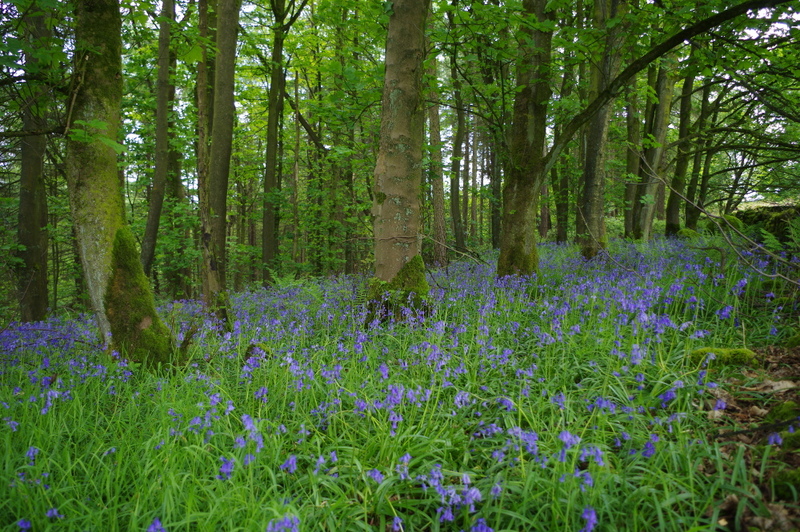 Bluebells in Dudwood, seen from the access land. 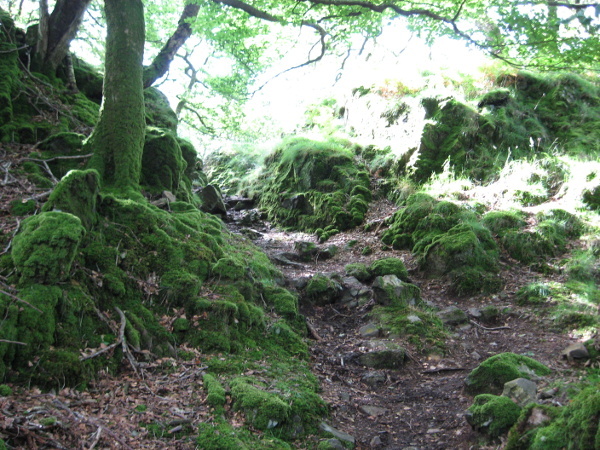 Some of the mossy rocks can be seen on the far right by the wall and path.